You don't explain how to get the second color onto your needles. When you cast on, you only use the first color. Can you tell me what to do to get the second color on? I want to try this stitch. Very pretty. There really isn't anything to explain. You just begin using the other color as I did in the video. Just drop one yarn, pick up the other yarn and knit with it. That's all. Yes, but your second yarn is already attached since you have been knitting for several rows. How do you attach it to your needles. It doesn't just hang there, does it? Doesn't it have to be attached to something? I'm confused. I haven't been knitting that long. Please show me or tell me. I did tell you. All you do is begin knitting the row with the new color -- it really is what you do whether it's the first time you use the different color or if you're fifty rows into the knitting. Instead of knitting with one yarn, you put the second yarn in your hand and knit with it instead. I'm sure if you actually give it a try you'll see that it isn't as hard as you think. Good luck! Thank you so much for the tutorial! I've made a really nice scarf for my mom which I'm sure she's gonna love. However I was wondering how exactly do you cast off for this kind of stitch? I'm still a beginner and dont want to ruin this nice scarf with a bad bind off. You can just cast off as normal. I usually use the standard knitted bind off on things unless I need something more stretchy. You will need to knit a gauge swatch to determine your gauge with the yarn and needles you plan to use. Once you have your stitches per inch, you can calculate how many to cast on to make the size you want. This is a beautiful pattern. I want to try it. Can you tell me the needle size and the yarn you used. I never did a gauge swatch. 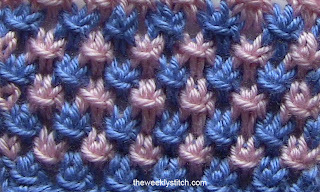 When you say to do a gauge swatch do you do it in the star stitch pattern or do you do it in stockinette stitch? I enjoyed your video and the beautiful pattern very much - thank you! Can I ask you a question referring to how to knit reglan pattern? I am not a sweater knitter, and have never knit a raglan. You may want to post your questions on a forum such as knittinghelp.com or Knitting Paradise.